When I first saw this next car I was going to say that it looks about as much like a Bugatti as I look like Brad Pitt...but then I noticed that it was cheap. Really cheap. And I will forgive a lot of nonsense for a good price, so you can call this pile of parts a Ferrari for all I care. 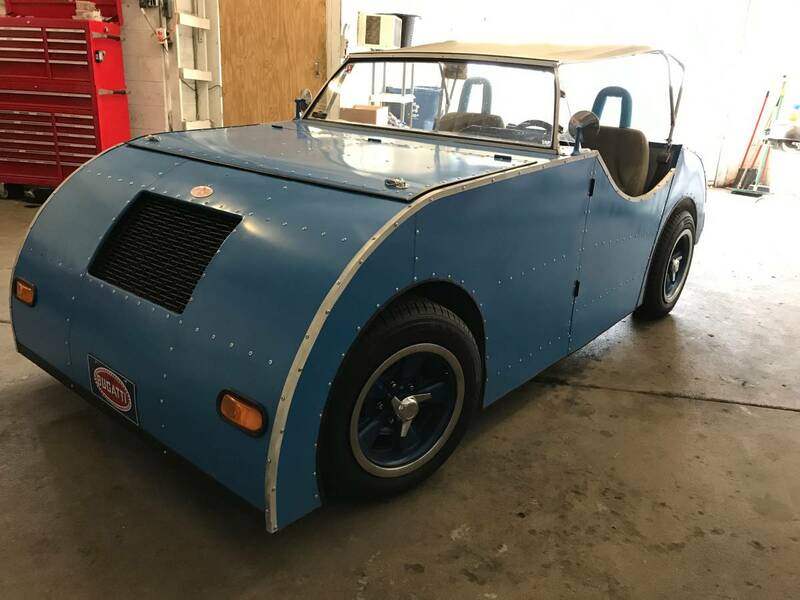 Find this Bugatti kit car built on a 1989 Chevrolet S-10 Chassis offered for $3600 in Kokomo, IN via craigslist. Car is street legal with title..
Nope, I do not see a better way to drive Bugatti crazy. Just be sure to drive it home before dark. The bodywork brings to mind another legendary Italian name in vehicle manufacturing: Zamboni. 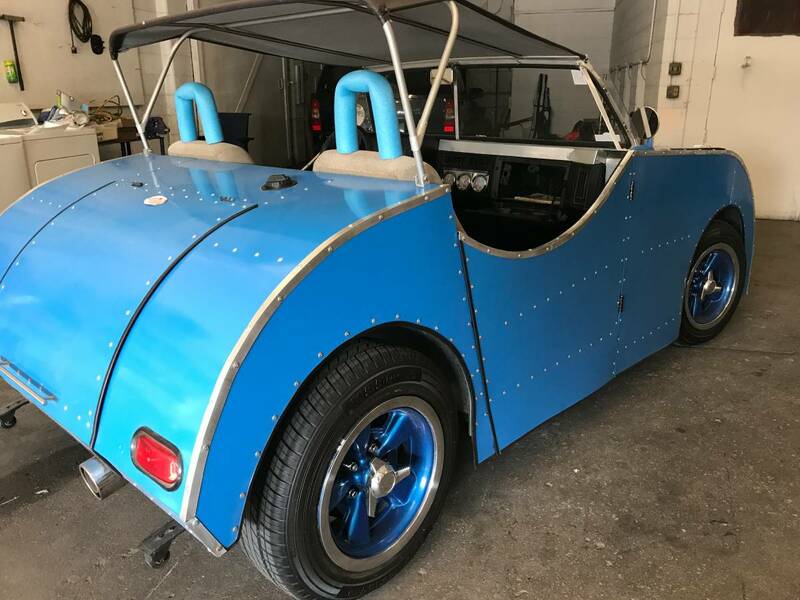 If you Google "Bugatti Tank Car" you'll find a real antique Bugatti that looks a lot like this build. He's really not too far off! well, pluck a duck - the 1923 Bugatti Type 32 Grand Prix racer "Tank de Tours"
Bugatti's first attempts at aerodynamics (which were in their early stages in 1923). Only raced once, because it handled well, like a tank. I've seen some pretty amazing cars in my life. Great googley moogeling, though, kaibeezy. My first thought was "Of all the Bugattis out there you could build a replica of, he picks the ugliest one?" Then I realized the right question was, "If my sheet metal skills are at the level of an entry level ductowork builder, could I copy the world's ugliest Bugatti?" I think the wheel to car size ratio works for the real thing, the S-10 wheels just look so small. Possibly the only thing that needs to be donked to look right. I have a S-10 frame and 1,000,000 rivets what should I do this weekend? Ohh I got it build a Bugatti! "Whuh? Ya say that thar tanky thing was made by B00-gawty? I'ma gonna make me one o' them Buggo Tanks this here weekend in mah garage, whiles I watch me some bawl games..."
Dang there are some lucky new owners out there. The van and now this. From the motor home and RV manufacturing capital of the world. This must be what big tin box makers do in retirement. Such a fun looking car! I think I'd write an essay for writersperhour.com about it. It will be an entertaining piece for reading.